"Cool and refreshing juice -- mellow watermelon and cucumber juice with a touch of tartness from the lime." 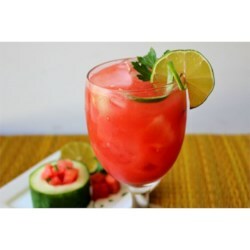 Run the watermelon and cucumber pieces through a juicer following manufacturer's instructions, and place juice into a pitcher. Stir in lime juice, and serve. alcohol and crushed ice too! We added the rind of both the watermelon and the cucumber as well (95% of the vitamins) and a touch of local honey. Good and good for you. Loved it. Tried a glass first with just a little salt and pepper added. Great. Then I added a shot of vodka. Even better. I did use pickling cucumbers so no bitter taste.